William H. Stoddard, with Peter dell’Orto, Dan Howard, and Matt Riggsby, GURPS Fourth Edition Low-Tech. Steve Jackson Games: Austin, TX, 2010. Link to publishers’ online store. Its a hard time for small publishers. On November the 12th Steve Jackson Games released its annual Report to the Stakeholders and announced that in a year with their second highest revenues ever they could not afford to print their fully typeset GURPS Discworld. Apparently they have a much harder time selling their roleplaying games than their card and board games. I think that is a shame, because many of their books would be valuable outside the small number of people who play games with the GURPS rules. One of these books is GURPS Fourth Edition Low-Tech. Since 1986, GURPS has eked out a place in the market for roleplaying games as the system which on one hand makes the relationship between game mechanics and events in the real world clear, and on the other hand offers broadly reasonable results when ordinary people try to do ordinary things. In systems based on D&D, for example, its very hard to explain what “you hit for 13 points of damage” means within the game world (some things have lots of hit points because they are big and tough, others because they are skillful and nimble or just very heroic, so not all “hits” or “13 points of damage” mean the same thing). GURPS’ dialogue with the real world attracts gamers and writers who are experts on some area or just think that the real world has more exciting details than most people can invent from whole cloth. In this case, that produced a book with four authors, nineteen other contributors, and a legendary playtest full of enthusiastic discussions of low-tech contraception (a much neglected detail in adventure fiction!) and whether Polynesian stick charts count as maps and allow the use of Navigation skill. Its very appropriate that an older version of GURPS licensed two L. Sprague de Camp settings (Planet Krishna and the Hyborian Age back when de Camp was publishing Conan pastiches and fanzines), because GURPS lends itself to the kind of fantasy where the heroes worry about money and escape danger by knowing a technical trick which their enemies do not. Low-Tech attempts to organize and list all of the tools and technologies invented before 1730 and interesting to characters in stories about adventurers, mystics, technicians, or inventors. Given limited space and a house style which forbids citing sources, the authors made some very wise choices about what to concentrate on. Low-Tech focuses on explaining what a particular item does, and how it compares to alternatives. There are many books and articles which give a history of locks from prehistoric wooden cords-and-bolts to the first combination locks; this book gives a very concise overview of each type, but then tries to answer how difficult each of these types is to pick or break, and how the would-be thief goes about those tasks. Every item has a cost (arbitrary), a weight (usually at least estimated on the back of an envelope), and some kind of game mechanic attached. The sidebar from a previous edition which meticulously listed kJ per pound for various fuels without ever explaining what a kJ of fuel could do is mercifully absent. Items without meaningful practical differences are combined into generic categories such as “Summer Clothing” or “Shortsword” with a few examples of the variety of real objects which these items can represent. Low-Tech also focuses on objects which are likely to be used by important characters in an adventure story. This includes firearms and jollyboats, but also timekeepers, writing equipment, surgical instruments, and ritual paraphernalia. For gamers and storytellers, this makes it a valuable compliment to books which focus on the technologies of everyday life or on things which survive well in the ground. A few tools which were obscure in our world, like beekeeping suits and asbestos clothing, can be disproportionately significant in games and stories. The short entries for each item inspire visions of interesting scenes in a story or roleplaying game. A brief section at the beginning summarizes foundational technologies, from fibres to pottery to the seven classical metals, and reminds readers of some of the ways in which a preindustrial economy is different from a modern one. This book also does its best to describe the world history of technology, and not just Europe and perhaps East Asia. So it gives space to South East Asian lantaka cannons, Byzantine and Islamic fire-siphons, Chinese miniature clepsydras, and Inuit igloos as well as to the usual plate armour, movable type, battle wagons, and yurts. A page and a half discuss how to fit technology outside of Europe into GURPS’ Tech Level system, and how to invent or describe alternate histories of technology, while a sidebar discusses ever-popular attempts to make or invent gunpowder in primitive surroundings and another half-page discusses the Connecticut Yankee scenario more broadly. This broadmindedness is reflected in the bibliography, a place of eclectic surprises where Sawyer and Sawyer’s translation of The Seven Military Classics of Ancient China is followed by Wolfgang Schivelbusch’s Tastes of Paradise: A Social History of Spices, Stimulants, and Intoxicants (Vintage, 1993) and John F. Schumaker’s The Corruption of Reality: A Unified Theory of Religion, Hypnosis, and Psychopathology (Prometheus Books, 1995). 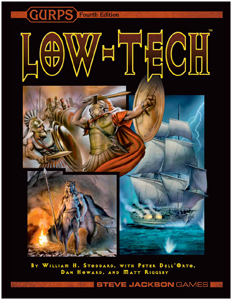 In short, GURPS Fourth Edition Low-Tech has something to offer anyone interested in the preindustrial world, whether roleplaying gamers, historical novelists, or fans of adventure fiction. The focus on the questions “how big and heavy is this?” “what does it do?” and “how does it compare to the alternatives?” is valuable even if one could wish that the authors had room to explain the answers which they give. The focus on breadth and on distinguishing only things which have significant practical differences is also a useful compliment to academic volumes which assign ten topics to ten different authors who never read each other’s work, or chronicle with great intensity changes of fashion in the pottery industry. And its certainly the most fun and thoughtful book of technology for a roleplaying game which I have read. Back in the day, I played Gurps a couple of times. The problem I had with it, was that it seemed to take hours to resolve battles that were only supposed to be taking a few minutes. Much too short of a turn sequence. I recall really liking their martial arts supplement though. I have been reading Shannon Appelcline’s Designers and Dragons. Brings back a lot of memories. Including that of SJG being raided by the Secret Service in 1990 over issues of computer hacking. What I didn’t know was that there was actually some legitimate logic to why the raid took place. SJG’s managing editor did have a major connection (or really a role in) the hacking community of the day, and it didn’t help when the SS find copies of Gurps Cyperpunk on the companies computers when they make their raid. “Designers and Dragons” is on my TOREAD file but I don’t have money for it right now. I didn’t hear that there was some basis to the suspicion of the SJG staffer who the Secret Services decided to raid. Quite a few games seem to have the reverse problem, where they underestimate what people can do in a few seconds with edged weapons or modern firearms. Designing combat rules which work well for both “suddenly the ambassador pulls out a knife and lunges at the princess!” and “Ok, so that is 200 metres away … there are some fences and canals which will give cover from where you think the enemy are but you may come under fire” or “as you ride back from singlehandedly destroying that army, another horde of orcs blocks your path” is hard, especially since ordinary people have to use them.